Please click here to go to complete this journey’s Registration. You will be asked for your passport number; if you will need to renew your passport before this trip, simply fill in your old information and update us when you receive your new passport. At the end of the form, please press “submit” to finalize your answers. Your spot is not considered reserved until you have completed these questions and contract and submitted your deposit. First and foremost, your passport MUST be valid at least 6 months beyond the end date of the trip (that is, May 12, 2020), and you’ll need two empty pages in the Visas section of your passport (make sure they are in the Visa section, not the Amendment or Endorsement section). You will need to arrange an Indian visa before you arrive; we will provide you more detailed information before you apply for your visa. You can get your Nepal visa upon arrival in Nepal for $25 USD. You can apply for your Indian Visa on Arrival 4 to 120 days in advance of your arrival on this website. Please click here to read our blog about how to apply for this visa. (Please click here to make sure your country is eligible for a Visa on Arrival). Vegetarians should have no problem anywhere on our travels. The only thing that might prove difficult is veganism in India. Although meat is entirely avoidable, India is the world’s largest consumer of butter, and it is almost unavoidable in most of their curries, stews, and even breads. Many vegans that we have known to travel through India adopt what is locally referred to as a “pure veg” diet: no meat, no eggs, but it allows for dairy consumption. (It is worth nothing that some of the reasons for avoiding dairy consumption in the west is slightly mitigated here, as there is less factory farming and antibiotic use in livestock.) Milk can be avoided by not consuming creamy dishes or milk tea. None are required to enter India, but we suggest you work with your physician or your area’s travel health expert to decide what options are best for you. You can read the CDC’s recommendations here and the UK NHS recommendations here. Please work with your physician or travel doctor when making these choices. Please see our blog about this topic for more information. Here is an NHS malaria map for India and one for Nepal. Participants should be able to comfortably climb stairs, slowly but in a stable fashion. Guests should be able to walk unassisted for 1 mile at a time. We will be out of the hotel touring 6-8 hours on most days that we aren’t traveling from one location to the next, although there will still be an opportunity during those stints to sit and rest. That is entirely up to you and how much shopping you want to do. All of your meals and transportation are covered, so you just have to gauge how much you want to spend on extras. You can either exchange cash in India or use a local ATM (which we personally prefer for ourselves). Just make sure you call your bank and credit card company to let them know you’ll be traveling in India, so they don’t put a hold on your card when they see it being used halfway across the world. Each of our hotels will have a private ensuite bathroom, air conditioning, and WiFi access (although sometimes the connection will not extend to the rooms, but only be usable in common areas like the lobby or restaurant). We will be sending out a list of hotel names to guests several months before the journey. Before the trip begins we will give you a contact for our hotels; in addition, we will give you our Indian phone numbers and WhatsApp numbers ahead of time, as well as an American number good for text messages and voicemails. There will be WiFi available at all of our hotels. If you choose to bring your cell phone or tablet, you can use VoIP services such as Skype, WhatsApp, and FaceTime (audio) to connect with your loved ones at home, as well. Your hotel night in Delhi on the night of November 1st is included in this journey. In order to get some rest before our flight to Varanasi on November 2nd, we recommend arriving in Delhi before midnight on the 1st. However, if your flight comes in early morning the 2nd (midnight through 2 AM), that will also work. 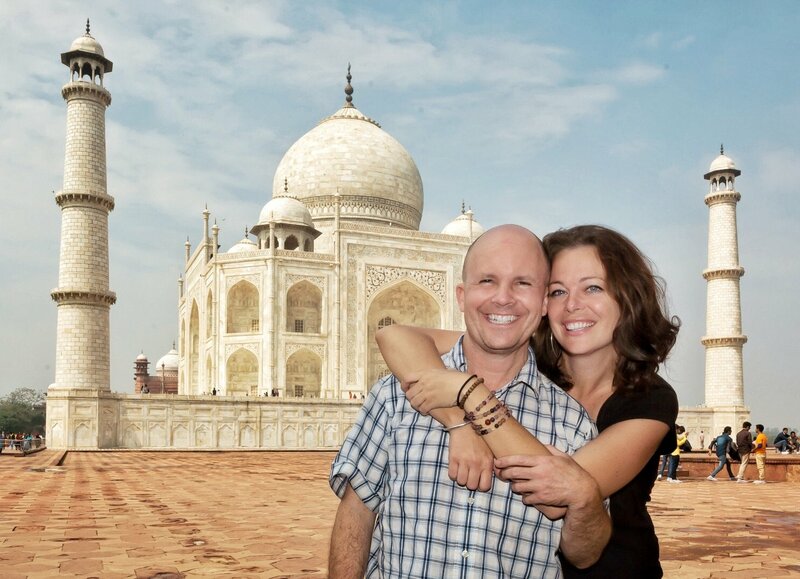 If you wish to arrive in India early to get accustomed to the time zone, we can help you arrange accommodations and/or give recommendations for activities. What time should I book my departing flight from India? We are scheduled to arrive in Delhi on a flight from Lucknow at 5 PM on November 13th. However, it is always wise to allow for flight delays (not terribly uncommon in India) and not book your departing flight until after 10 PM on November 13th or later. The expected and historical temperatures on this journey range between 60°F (15°C) at nights and 92°F (34°C) during the day, with each location being extremely similar. This means mornings and late evenings might be cool, but temperatures will get to 90°+ in the afternoons. This is not a rainy time of year, although it will still be humid. Tempel Smith began practicing vipassana and metta meditation in 1989 within the Theravada Buddhist tradition at Insight Meditation Society (IMS). Tempel focused his younger years on service and activism within nuclear disarmament, environmental protection, and working in crisis shelters for homeless and abused youth. In 1997 he spent a year in Myanmar (Burma) as an ordained monk with both Ven. Sayadaw U Pandita and Ven. Pa Auk Sayadaw, and later practiced in silence for a nine-month retreat back at the IMS. Since 2001 Tempel has begun to teach meditation and Buddhist psychology to a wide variety of people including prisoners, activists, youth, service providers, and those with severe and chronic illnesses. He founded the B.A.S.E. House in San Francisco – a residential community dedicated to living a socially engaged Buddhist life. Tempel spent a year in volunteer service for Zen Hospice, and in 2003 he initiated an international meditation retreat and program for teenagers and young adults which became iBme (Inward Bound Mindfulness Education). Tempel worked for the Buddhist Peace Fellowship in Berkeley coordinating the B.A.S.E. and Young Adults programs and also has lead pilgrimages in Thailand, Burma, and India for the past ten years. In 2008 Tempel joined a four-year teacher training program run by Jack Kornfield, Spirit Rock Meditation Center (SRMC) and IMS, and now leads the 2-year Dedicated Practitioner Program. The Dharma Tempel teaches is informed by western sciences and psychology, Theravada Buddhism, and somatic based trauma healing. See more at TempelSmith.info. Established in 1990 as a not-for-profit 501(c)(3) educational organization, The Tricycle Foundation is dedicated to making Buddhist teachings and practices broadly available. In 1991 the Foundation launched Tricycle: The Buddhist Review, the first magazine intended to present Buddhist perspectives to a Western readership. Tricycle soon became the leading independent journal of Buddhism in the West, where it continues to be the most inclusive and widely read vehicle for the dissemination of Buddhist views and values. Our readership includes longtime practitioners, those who are curious about Buddhism or meditation, and those who do not identify as Buddhist but value the teachings of wisdom and compassion that Buddhism has to offer. By remaining unaffiliated with any particular teacher, sect or lineage, Tricycle provides a unique and independent public forum for exploring Buddhism, establishing a dialogue between Buddhism and the broader culture, and introducing Buddhist thinking to Western disciplines. This approach has enabled Tricycle to successfully attract readers from all walks of life, many of whom desire to enrich their lives through a deeper knowledge of Buddhist traditions. Tricycle has been recognized with the prestigious Folio Award for Best Spiritual Magazine three times, and has twice garnered the Utne Media Award, most recently in 2013. As part of our commitment to our readers who are seeking to implement or sustain Buddhist values and practices, Tricycle accepts advertising only from teachers, programs, centers, and businesses whose offerings we believe will support those aims. Because of this selective policy, we depend on donations to support ever-rising printing and production costs, content updates to our website, and life-enriching programs. The Foundation also hosts occasional pilgrimages that provide opportunities for new and experienced practitioners to explore sites of importance to Buddhist history and practice. Helen Tworkov first traveled through Asia in the 1960s and this led to Buddhist studies in the Zen and Tibetan traditions. In 1991, she founded Tricycle: The Buddhist Review and today serves on its board of directors. She is the author of Zen in America, and co-author with Mingyur Rinpoche of Turning Confusion into Clarity: The Foundations of Tibetan Buddhism and In Love with the World: A Monk’s Journey through the Bardos of Living and Dying. Please enjoy these videos, taken by BJ on-site at each location. To enlarge each of the videos after pressing play, please click the square icon in the bottom right-hand corner of the video. Please click a photo to see an enlarged version and the location; you can use your arrow keys or mouse to navigate within the album. Want to see our other Pilgrimages with Tricycle? We love traveling with Tricycle: The Buddhist Review, and we know that you will enjoy these transformative journeys, too. Please click here to see all of our current Tricycle Pilgrimages at a glance.